The web-based version of the BITS Behavioral Management System is designed to meet the needs of a school district in a number of ways by providing tools for District Administrators, School Principals and Educators. At the system's core is a robust and easily configurable behavior tracking system that will help your district monitor, manage and ultimately improve upon student behavioral issues. 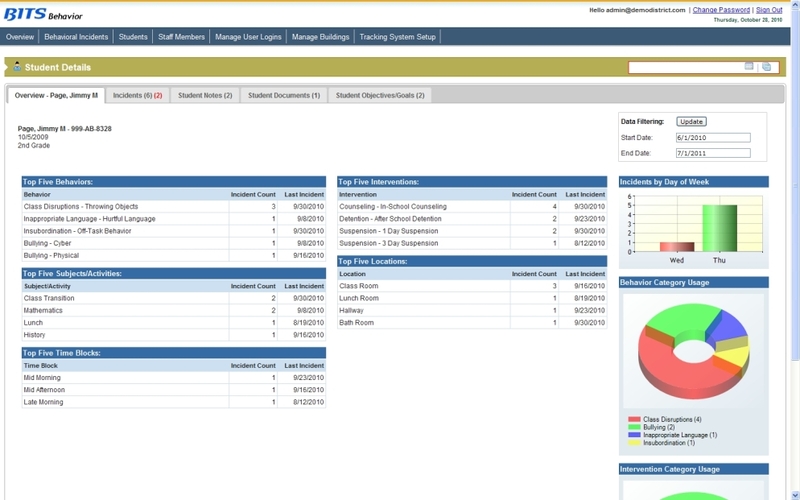 The web-based version of the BITS Behavior Management System is a multi-user, multi-role behavior tracking and reporting system designed to meet the needs of an entire school district. Powerful reporting and analytical tools provide insights into behavioral trends for individual students, individual schools and the entire district. There are three main "Roles" included with the BITS Web-Based behavior management system, District Administrators, Principals and Educators. Each role within itself would make for a powerful behavior tracking system. The powerful user administration system allows you to quickly create users and see specific behavior data created by those accounts. We invite you to try the online demo of the web-based version of the BITS Behavior Managment System. You will be able to log in as a District Administrator, Principal and Educator. 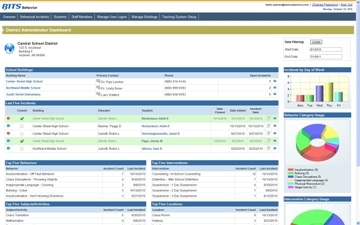 You can create and manage incidents, manage tracking data and more. Please call (816) 694-7511 if you would prefer a personal presentation of the system.